Configure AAD to trust your Octopus Deploy instance (by setting it up as an App in AAD). Optionally map AAD Users into Roles so you the users can be automatically connected to Octopus Teams. Configure your Octopus Deploy instance to trust and use AAD as an Identity Provider. The first steps are to configure your Azure Active Directory to trust your instance of Octopus Deploy by configuring an App in your AAD. 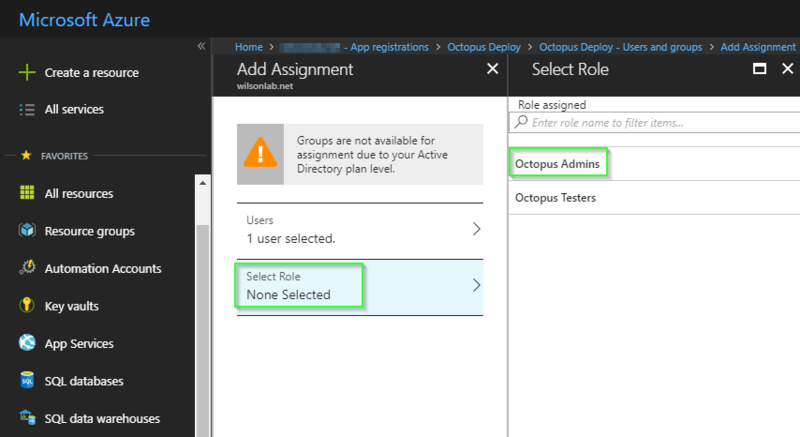 In order to configure the your instance of Octopus Deploy as an App, you will need administrator permissions to the desired Azure Active Directory tenant in your subscription. Login to the "Azure Portal" , click on your account positioned at the top-right of the screen, then select your desired directory. 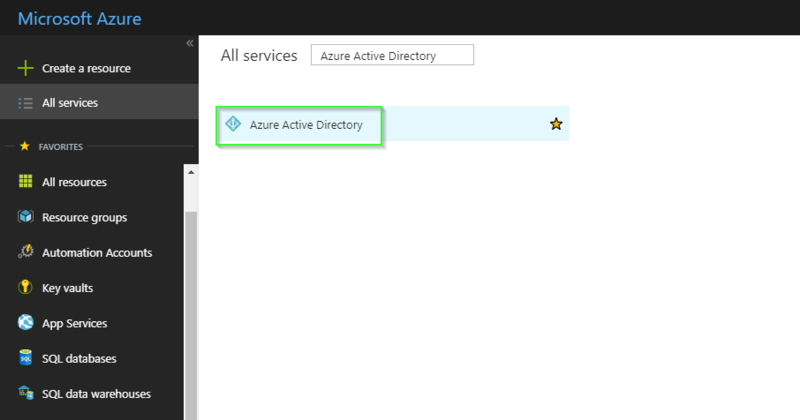 Click the All services button and select the Azure Active Directory service. Choose a Name like Octopus Deploy, specify Application Type of Web app/API, and enter a value for Sign-On URL like https://octopus.example.com Then click Create. The value you specify for Name will appear at the top of the Azure authentication page when the users are entering their credentials. The value you specify for Sign-On URL should be a public URL to your own Octopus Server. 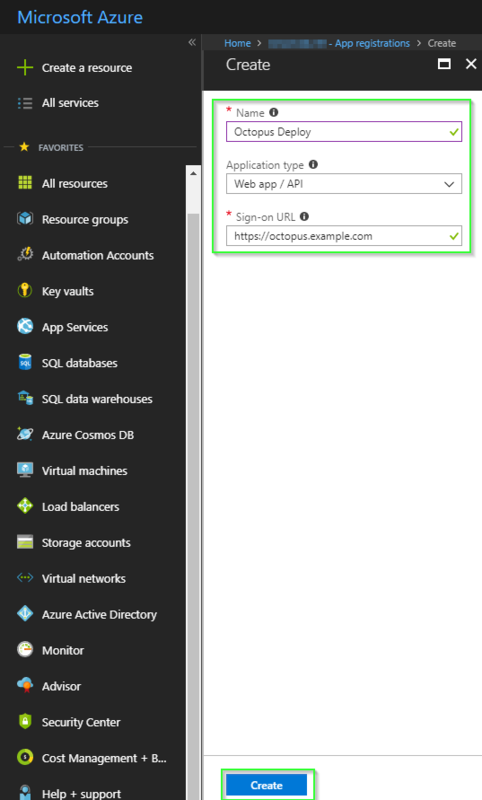 During the authentication with Azure AD, the user will be directed to an Azure page to enter their credentials. As part of the authentication flow, Octopus passes a Reply URL to tell Azure where to POST the user's security token. This URL must be added to a trusted whitelist in the App configuration or the authentication flow will be terminated by Azure. 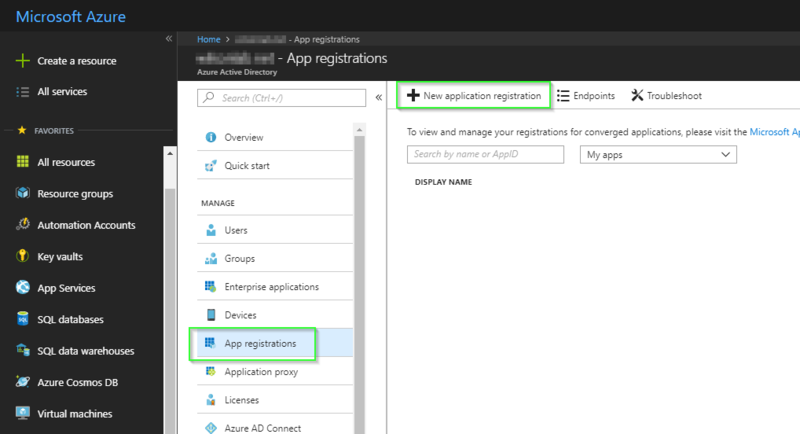 Find your new App registration in AzureAD. To ensure your new App registration appears in the list, you will need to set the filter to All apps. Select Settings and choose Reply URLs. Under the Reply URLs section, enter the public URL to your Octopus Server with /api/users/authenticatedToken/AzureAD attached to the end. In our example this would be https://octopus.example.com/api/users/authenticatedToken/AzureAD. Please take care when adding this URL! They are case-sensitive and can be sensitive to trailing slash characters. The specification highly recommends using SSL to ensure the security and integrity of your tokens. You can use http here if you do not have SSL enabled on the public interface of your Octopus Server. Please beware of the security implications in accepting a security token over an insecure channel. If you want to manage user/team membership via AAD, you will need to configure Roles for your App. To add a Role(s) you will need to edit the App's manifest. Under the App Registration, select Manifest and select Edit to modify your manifest as required. The example below illustrates two roles, one for administrators and one for application testers. Make sure you replace the NEWGUIDs with a generated guid (unique per entry). Once you have completed editing the manifest, select the Save option. The value property is the most important one. This value becomes the external Role ID you will use later on when adding this role to a Team in Octopus Deploy. Want a more advanced manifest? For more advanced scenarios, please see the Azure manifest file documentation. Once the App Role(s) have been defined, users/groups from Azure AD may be mapped into these Roles. Under the App Registration, select your App registrations name under Managed application in local directory. Choose Users and groups and select Add user to create a new role assignment. Select the users which you would like to assign roles to. Next, under Select Role specify one of the AppRoles that you added to the App registration manifest. To save your changes, select the Assign button. If you only have one Role it will be automatically assigned. If you have multiple Roles a popup will appear when you click the Assign button so you can select the Role to assign. 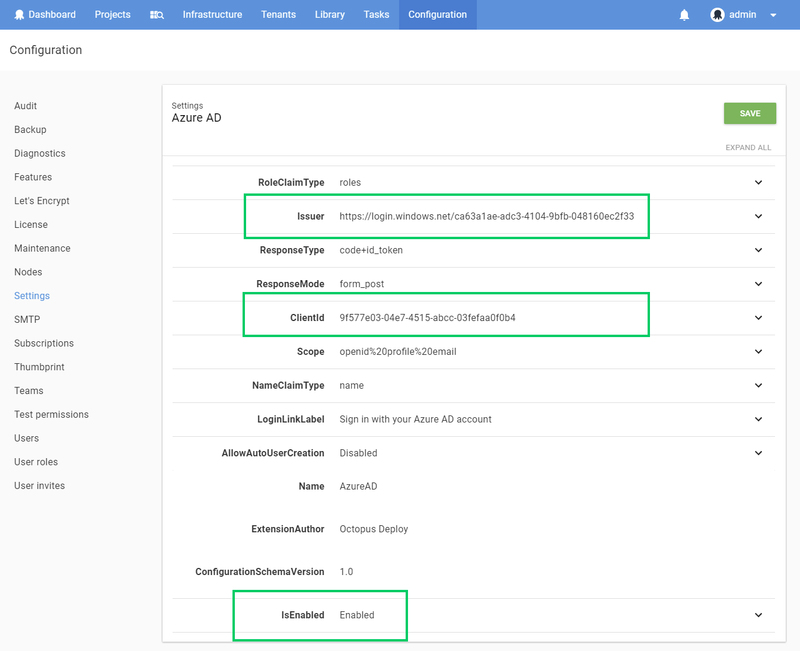 There are two values you will need from the Azure AD configuration to complete the Octopus configuration: the Client ID and Issuer. Your Client ID should be a GUID. 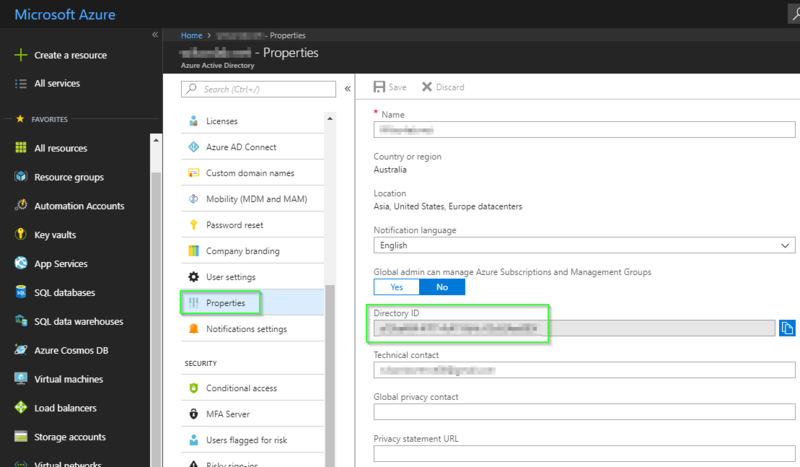 Your Issuer should be a URL like https://login.microsoftonline.com/GUID where the GUID is a special GUID identifying your Azure Active Directory tenant. Alternatively these settings can be defined through the user interface by selecting Configuration ➜ Settings ➜ Azure AD and populating the fields Issuer, ClientId and IsEnabled. If you followed the optional steps for modifying the App registration's manifest to include new roles, you can assign them to Teams in the Octopus Portal. Open the Octopus Portal and select Configuration ➜ Teams. Either Create a new Team or select an existing one. Under the Members section, select the option Add External Group/Role. Enter the details from your App registration's manifest. In this example we need to supply octopusTesters as the Group/Role ID and Octopus Testers as the Display Name. Save your changes by clicking the Save button. Even if you are using an external identity provider, Octopus still requires a user account so you can assign those people to Octopus teams and subsequently grant permissions to Octopus resources. Octopus will automatically create a user account based on the profile information returned in the security token, which includes an Identifier, Name, and Email Address. When the security token is returned from the external identity provider, Octopus looks for a user account with a matching Identifier. If there is no match, Octopus looks for a user account with a matching Email Address. If a user account is found, the External Identifier will be added to the user account for next time. If a user account is not found, Octopus will create one using the profile information in the security token. Already have Octopus user accounts? If you already have Octopus user accounts and you want to enable external authentication, simply make sure the Email Address matches in both Octopus and the external identity provider. This means your existing users will be able to sign in using an external identity provider and still belong to the same teams in Octopus. The most important part in this command is email, as usernames are not necessarily included in the claims from the external providers. When the user logs in the matching logic must be able to align their user record based on the email from the external provider or they will not be granted permissions. Now you're using an external identity provider it is easy to increase your security. You could consider configuring Multi-Factor Authentication - after all Octopus Deploy has access to your production environments! You should also consider disabling any authentication providers you aren't using, like Username and Password authentication which can now be disabled since Octopus 3.5. We do our best to log warnings to your Octopus Server log whenever possible. If you are having difficulty configuring Octopus to authenticate with Azure Active Directory, be sure to check your server logs for warnings. you don't have any typos or copy-paste errors. remember to remove or add slash characters as we've instructed - they matter too! You can see the OpenID Connect metadata by going to the Issuer address in your browser adding/.well-known/openid-configuration to the end. In our example this would have been something like https://login.microsoftonline.com/b91ebf6a-84be-4c6f-97f3-32a1d0a11c8a/.well-known/openid-configuration. Open the Developer Tools of your browser and enable Network logging making sure the network logging is preserved across requests. In Chrome Dev Tools this is called "Preserve Log". Attempt to sign into Octopus using Azure AD and find the HTTP POST coming back to your Octopus instance from Azure AD on a route like /api/users/authenticatedToken/azureAD. You should see an id_token field in the HTTP POST body. Grab the contents of the id_token field and paste that into https://jwt.io/ which will decode the token for you. Don't worry if jwt.io complains about the token signature, it doesn't support RS256 which is used by Azure AD. Octopus uses most of the data to validate the token, but primarily uses the sub, email and name claims. If these claims are not present you will likely see unexpected behavior. 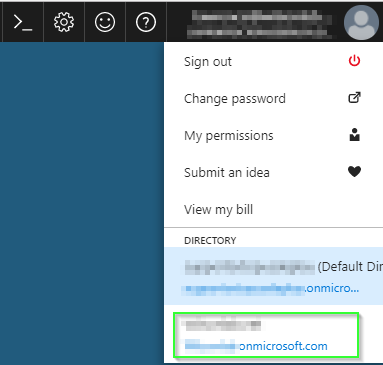 The contents of your OpenID Connect Metadata or the link to download it (see above) - this can be different for each Azure AD App. A copy of the decoded payload for some security tokens (see above) - perhaps some are working as expected and others are not. A screenshot of the Octopus User Accounts including their username, email address and name.